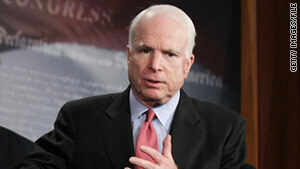 Sen. John McCain talked about the 2012 GOP presidential candidates on Sunday. McCain: "We cannot repeat the lessons of the 1930s"
Washington (CNN) -- Sen. John McCain, the Republican presidential candidate in 2008, took aim Sunday at the field of contenders for the 2012 GOP nomination, accusing them of "isolationism." "We cannot repeat the lessons of the 1930s, when the United States of America stood by while bad things happened in the world," McCain said in an interview with ABC's "This Week." Citing what he viewed as the GOP presidential hopefuls' positions in general on both Libya and Afghanistan, McCain said, "We are the lead nation in the world, and America matters, and we must lead. But sometimes that leadership entails sacrifice, sadly." Asked about a threat by House Speaker John Boehner to consider cutting funding for U.S. involvement in the NATO-led military mission, McCain, R-Arizona, responded, "I was more concerned about what the candidates in New Hampshire the other night said," referring to a CNN debate among seven people seeking the Republican presidential nomination. "This is isolationism," McCain said. "There's always been an isolationist strain in the Republican Party, the Pat Buchanan wing of our party. But now it seems to have moved more center stage, so to speak." If former President Ronald Reagan had watched the debate, McCain said, he "would be saying that's not the Republican Party of the 20th century and now the 21st century. That is not the Republican Party that has been willing to stand up for freedom" for people all over the world. A bipartisan group of 10 lawmakers has filed suit against the Obama administration, alleging that continuing the U.S. military involvement in Libya without Congressional approval violates the War Powers Resolution. The Obama administration denies any violation. McCain said every president has disagreed with the constitutionality of the War Powers Resolution, "but they have adhered to it." "So the Congress of the United States should pass a resolution -- and Senator John Kerry (D-Massachusetts) and I have the resolution that's ready to go -- that would comply with the War Powers Act," McCain said. Libyan leader Moammar Gadhafi "was at the gates of Benghazi," McCain said. "He said he was going to go house to house to kill everybody. That's a city of 700,000 people. What would we be saying now if we had allowed for that to happen?" Citing the 1988 bombing of Pan Am Flight 103 and a 1986 Libyan sponsored bombing of a German disco frequented by U.S. soldiers, McCain said Gadhafi has Americans' blood "on his hands." "If Gadhafi remains in power, it's clear that you will see him engage in an escalated effort, of course, to harm the United States of America, obviously," he said. McCain was equally adamant that the U.S. mission in Afghanistan must continue. "We abandoned Afghanistan once, and we paid a very heavy price for it in the attacks of 9/11," he said. "So that is an important lesson that we must learn." In the CNN debate, former Massachusetts Gov. Mitt Romney, currently leading the pack of GOP hopefuls in polls, said "it's time for us to bring our troops home as soon as we possibly can, consistent with the word that comes from our generals that we can hand the country over." McCain took issue with that. "I wish that candidate Romney and all the others would sit down" with General David Petraeus, commander of the war in Afghanistan, "and understand how this counterinsurgency is working and succeeding," McCain said.